Jobster is a job search platform where employers and job seekers can enroll to find suitable employees or jobs respectively. Registration is free. At jobster, your skills can be matched to thousands of jobs from hundreds of employers. The jobster recruiter tool allows recruiters to manage job postings, client tracking and candidate tracking. It makes it easy to accurately match candidates for various jobs. Job seekers do not have to enroll to use this site. They have a search box where you can search for job listings in a specific area. Enrolling however ensures that your resume is listed for prospective employers to find. They have a personal career analytic tool that helps job seekers know where they stand in their career. With this tool, people can compare their skills and experiences with those of others in their field. 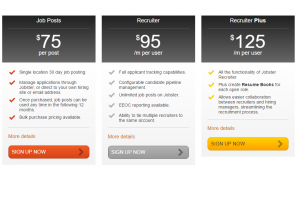 Recruiters have three plans they can choose from ranging in price from $ 75 to $ 125 a month/ user or post. These plans help stream line the recruiting process. If you have any experience with jobster, please leave a comment.